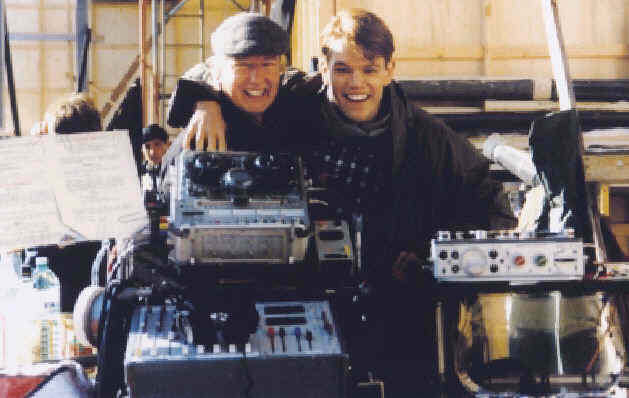 Nagra D Delivers Dialog for Scorcese’s "Gangs"
Ivan Sharrock (left) and Matt Damon (right) on the set of "Gangs of New York". Leading UK film sound mixer, Ivan Sharrock, has recently recorded the new Martin Scorcese feature, "Gangs of New York ", in Rome. A long time Nagra-D user, having bought his first in 1993, Ivan is using the Nagra-D’s advanced facilities to deliver the particular style of dialog recording beloved of the famous director. "Martin Scorcese loves original «live» sound and likes to have a lot of overlapping dialog," explains Ivan. "There are a great many interrupted conversations and «over-talking» from rival factions in the Gangs which means that nearly everything is «wired-for-sound» using Audio 2020 wireless systems and split tracks; which is where the 4-track Nagra-D gives the best possible chance to change an individual actor’s level in post production. I couldn’t give the coverage demanded by the director in any better way and still give the soundtrack my creative input, without the flexibility that theNagra-D allows." "I’m running six Audio UHF radios into a Soundcraft 8:4 mixer, with additional output feeding Video Assist and a Sennheiser evolution 500 series transmitter feeding seven receivers for the director, script supervisor, DP, dialog coach, camera operator, first assistant and producer. There is an additional transmitter for the dialog coach to allow him to listen in on a particular actor. A third Comtek transmitter feeds loop induction playback, as we have many scenes where musicians are in shot, so whilst their instruments are muted, they are able to mime to playback off of a Denon Minidisc player." Set in the mid 1800s and based on true stories of the various gangs that controlled the New York waterfront at that time, with the interaction of the corrupt city fathers, the film stars Leonardo DiCaprio, Daniel Day Lewis, Matt Damon, Cameron Diaz and Liam Neeson. Shooting, which began in September, mainly takes place using the huge studios at Cinecitta, and the extensive acreage of the back lot where Fellini made many of his films. "I have worked here many times," continues Ivan, "ever since The Last Emperor in 1987; most recently on U-571 where Stage 5 housed the 120 ft submarine interiors. For this film there is a five storey 1840’s mission hall." The Talented Mr. Ripley, U-571 (nominated for the Sound Oscar), and Proof of Life. Ivan’s faith in the recorder is demonstrated by the fact that he has never used a back-up machine. "If you can’t rely on your primary recorder, don’t use it. I have never seen a dual image camera using a split lens!" Ivan is about to purchase his second Nagra-D, a Nagra-DII, with the latest high performance 24-bit AD/DA converters and on-board 96kHz recording capability: "I have been hiring additional machines for the last eight years and it makes good business sense to purchase the latest technology. My original machine will be upgraded and primarily used for transfer work." " Nagra News " . No: 20. May 2001.